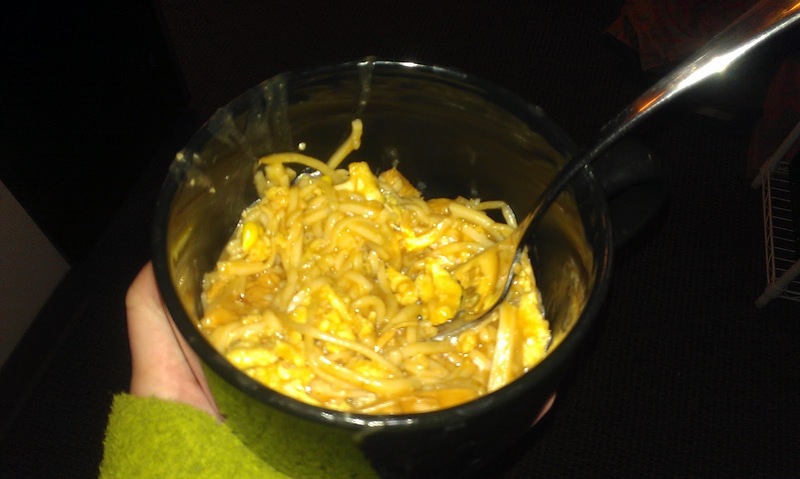 I was really excited several weeks ago when a friend of mine posted on Facebook that she had made pad thai and it was really good. Since I’ve recently acquired a taste for pad thai, I decided I had to try it. 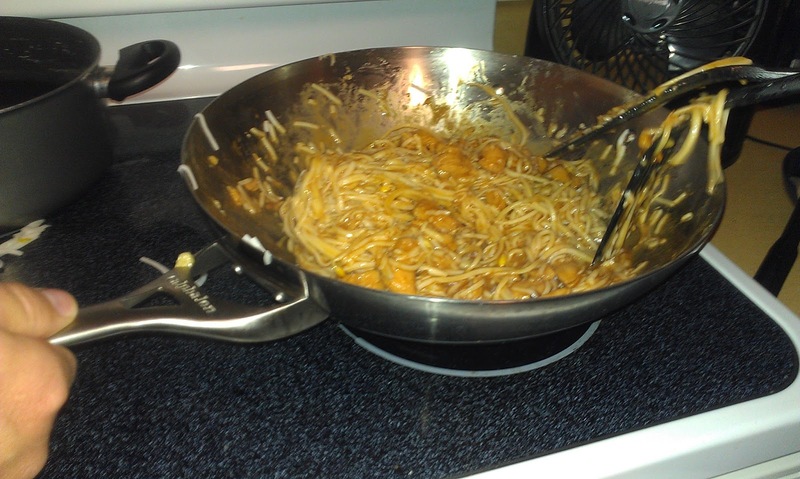 The recipe my friend used was for vegetarian pad thai, and I have a lot of chicken, so I searched for chicken pad thai and combined the recipes a bit – mainly, used the vegetarian recipe but copied the chicken pad thai recipe’s method of handling the chicken. One of the warnings I’ve seen about trying to make pad thai is that it is very difficult to not overcook the noodles. For this reason, I was relieved when the instructions said not to cook the noodles, but just to soak them in water. So we started by soaking the noodles in water. Meanwhile, I started prepping the meat. 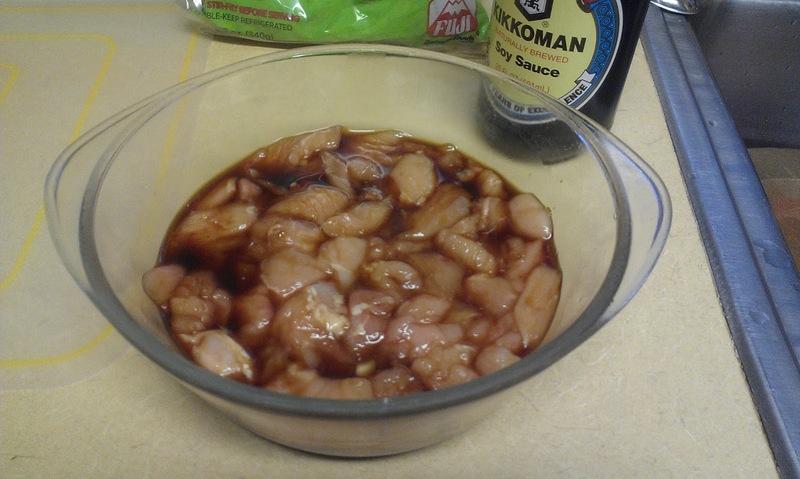 It had to marinade, mostly in soy sauce (I think it was soy sauce and corn starch). The recipe called for shallots but we didn’t have any, so instead we used onion and added some extra garlic (after extensive googling to check if this was a viable replacement for shallots, of course). Some of the shallots, or, in this case, all of the onion, was fried to eventually be a topping. The only particularly strange ingredient in the pad thai was tamarind. It’s a very sour fruit which I’ve managed to develop quite a taste for. 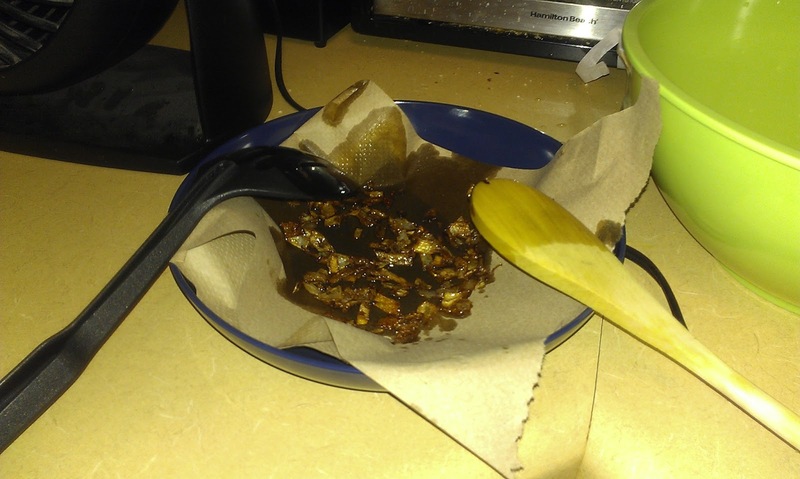 In this case, we boiled the tamarind so we had a thick paste, and then strained it, and then accidentally put the remnants (including several large seeds) in the garbage disposal. The measuring spoons also ended up down there. Whoops. Someone made sauce. I don’t really know what was in it, except that there was a lot of soy sauce. Enough soy sauce that we started to get a little suspicious – pad thai isn’t usually salty. The sauce also included sriracha. 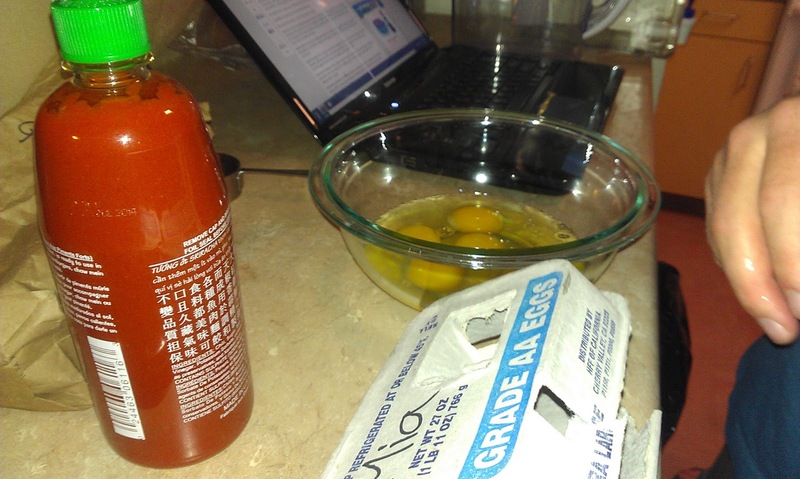 We didn’t have any sriracha, but that’s the benefit of living in a dorm – I ran around knocking on doors until I found some. Then eggs were cracked. The recipe called for a lot of eggs. I’m admittedly not quite sure what this was supposed to be a picture of. Chicken after frying. 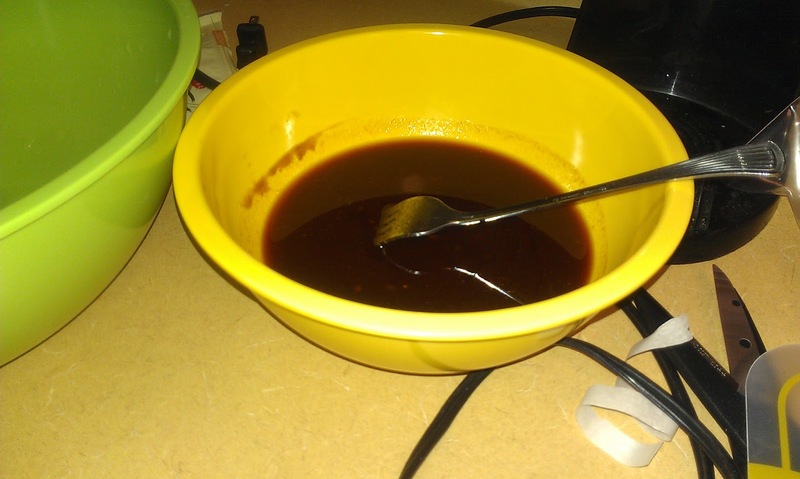 The marinade had an… interesting texture to it. We fried up the eggs basically like an omelet. Like I said, a lot of eggs. When we’d finally finished all that, we mixed the eggs, chicken, noodles, “shallots”, and some other things I didn’t get around to mentioning (bean sprouts, etc) together in the wok. All done! Looks delicious and exactly like pad thai, right? While everyone ate it and said it tasted good enough, this meal was very far from pad thai, and not exactly appetizing. If anything, it was a bad yakisoba. The only mistakes we really made were (maybe) marinading the chicken and (definitely) letting the noodles soak for too long. Remember how I said its easy to overcook the noodles? It’s really easy to oversoak them in cold water too, apparently. So we had somewhat slimy, overly soft noodles in our too-salty sauce. Sometime soon, I need to get real pad thai again so I can remember what it tastes like. 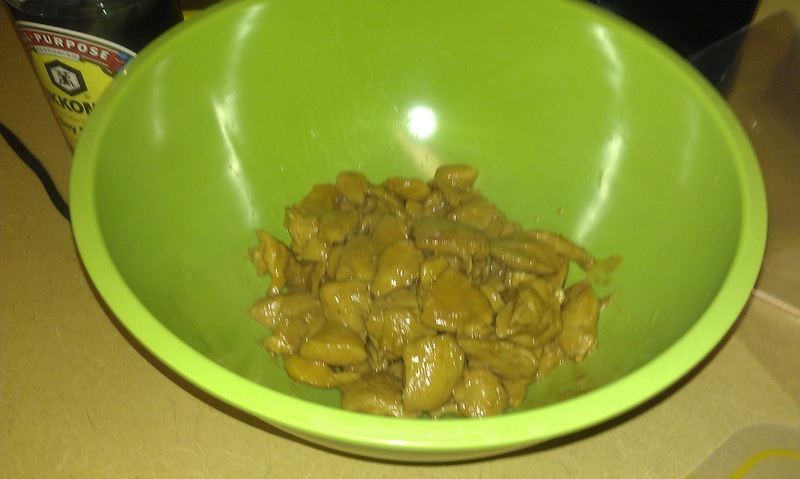 Mixbowl, anyone? Maybe I should have stuck to nachos? As mentioned in the previous post, I’m now on a quest to make Cinnabon Pretzels, a favorite snack which is now out of production. I’ve long wanted to try making cinnamon rolls again, but I never quite got up the courage again, until now. Now is a time of need. I started my search by looking for a Cinnabon Pretzel imitation recipe, but none exists. Step two: look for a Cinnabon cinnamon roll recipe. I found one, in a file on my hard drive, long ago downloaded from Reddit, that contains “tastes-like” recipes for a lot of famous foods (others I’m planning on trying in the near future include Bailey’s Irish Cream and Olive Garden alfredo sauce). So come Saturday and it’s time to bake. I open up the recipe only to find… surprise! I don’t have all the ingredients. Something about vanilla pudding mix? Pudding mix-less, I went for a different resource. A recipe I’d saved (and by saved I mean left the tab open in Firefox), for someone else’s Nana’s cinnamon rolls. The recipe looked easy enough, and I had all the ingredients, so I went for it. Of course, I couldn’t make it without a slight modification. Since I’ve been collecting apples from the dining hall left and right these days, and not exactly eating them left and right, I had a couple apples sitting on my bookshelf (and/or the shelf for food I don’t want to share, which means fruit and candy). More like, I had 12 apples sitting on my bookshelf and a couple were starting to get… less fresh. 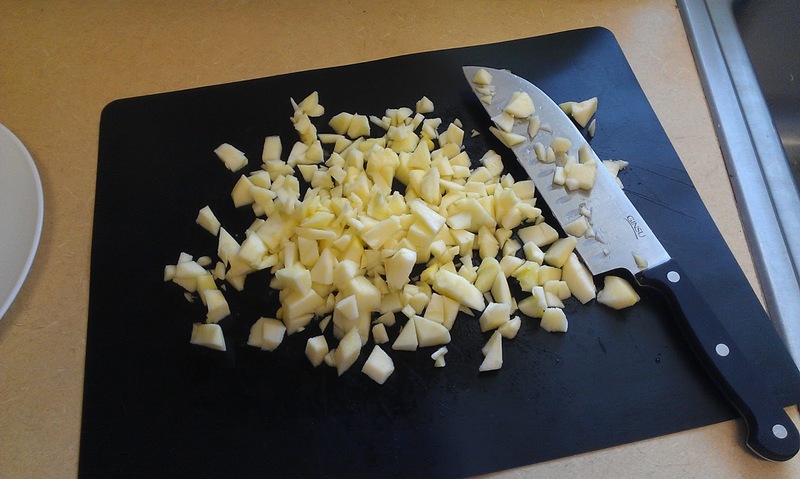 So I chopped those two apples up. Then I looked at the recipe and realized the appropriate place for adding apples was much later. So I mixed up the dough, let it rise… failed to take pictures of anything other than the first step… mixed up the cinnamon filling mixture, mixed in the apples, egg and other things that get mixed in later. I think I had to knead it a while too. What? I’ll write out the recipe later! 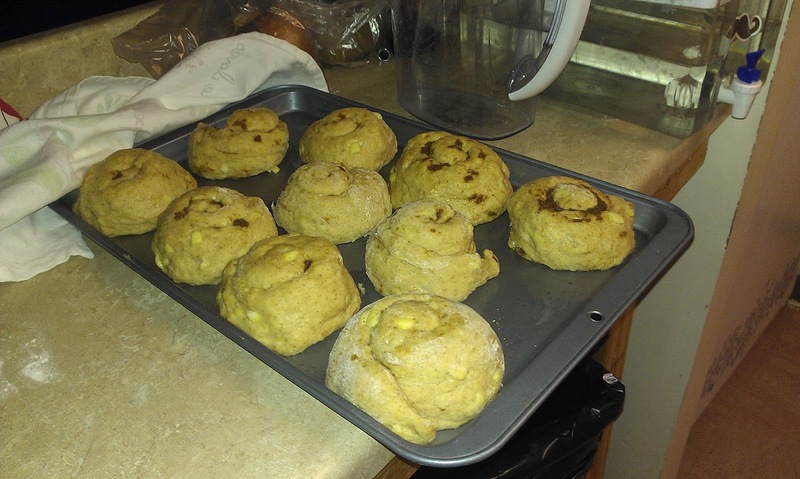 Once the dough and the filling were all mixed, I broke off pieces of dough to make each roll. 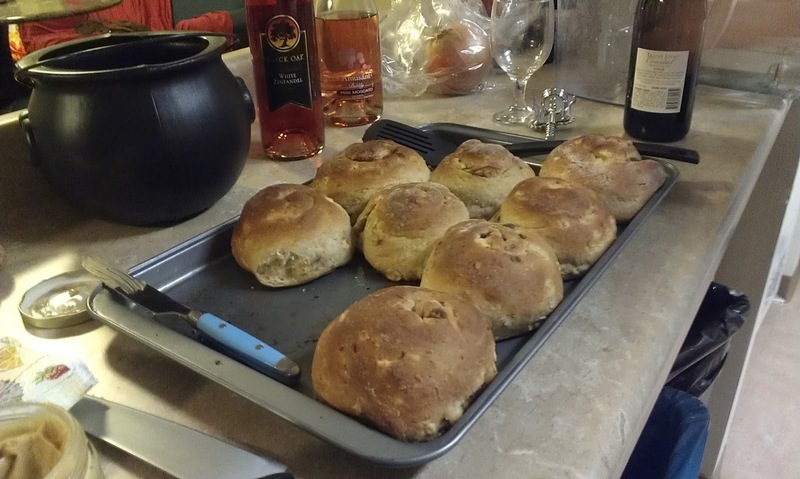 The recipe said to roll out the dough but the dough was quite sticky and my closest approximation of a rolling pin is an old, well-washed wine bottle, so I decided to just stretch and punch them into shape with my bare hands. Then I spread some filling on them, rolled them up, and lined them up on the pan. While baking, the grew a good deal. They also didn’t look anything like cinnamon rolls when I was done, so I ended up calling them Cinnamon Surprise Buns. You couldn’t see the filling from the outside, but once you opened them up there were veins of delicious cinnamon sugar. Basically, they turned out fantastic. A touch overcooked, especially on the bottom (I’ve been having consistent burnt-on-the-bottom issues lately), but still delicious, a good consistency, and perfect with some frosting. I had meant to whip up some cream cheese frosting to top them with, but apparently my good intentions weren’t enough to remember to buy cream cheese… so instead I topped them with the possibly slightly sketchy salted caramel cream cheese frosting that was left over from apple muffins last semester. Since they were a success, here’s the recipe, mostly copied from the link above but with my future tweaks added. 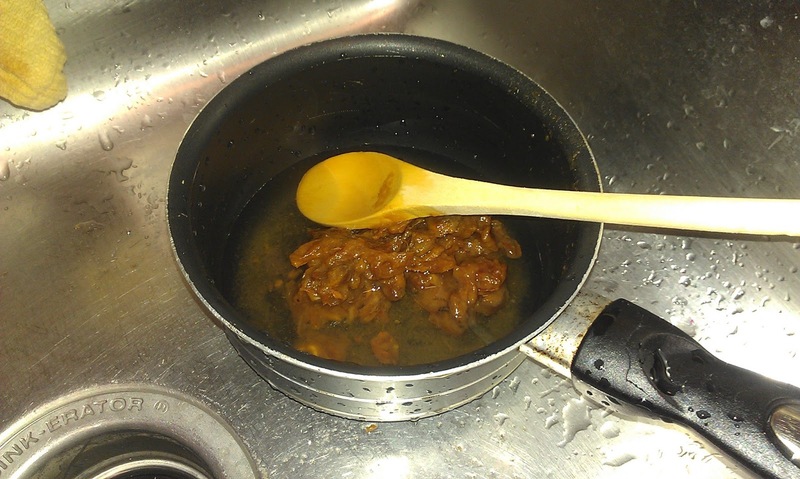 2 1/4 Teaspoon or one package yeast – I might have used less, I don’t know what conversion from package to measure I used. 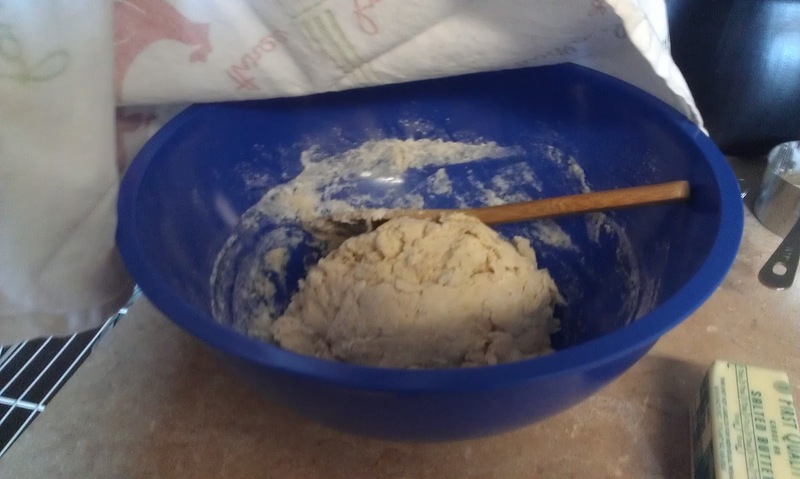 Blend the yeast mixture, 3 C of the flour, and the milk. Combine the butter, sugar and cinnamon for the filling, set aside. sugar, salt, cinnamon, eggs, butter, apples and 3/4 C flour to the risen dough and blend. of the filling mixture onto the rolled out dough. 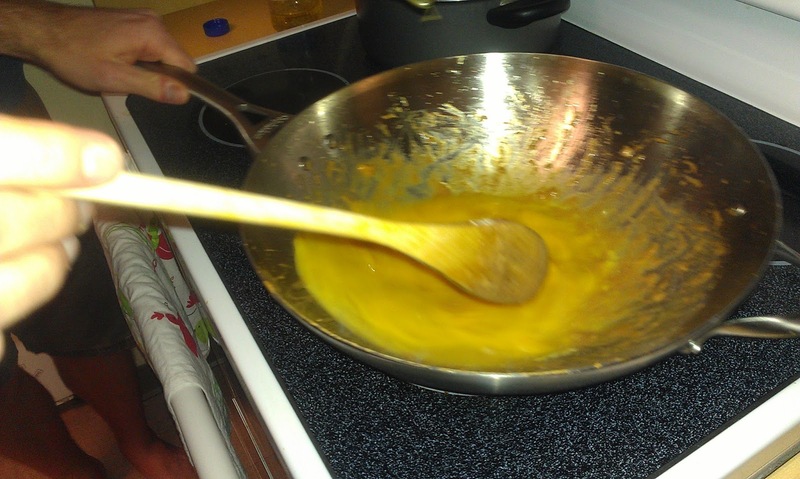 Wind into a coil, if possible, seal the bottom (to prevent filling from leaking all over the pan). Arrange wound rolls onto buttered pans. 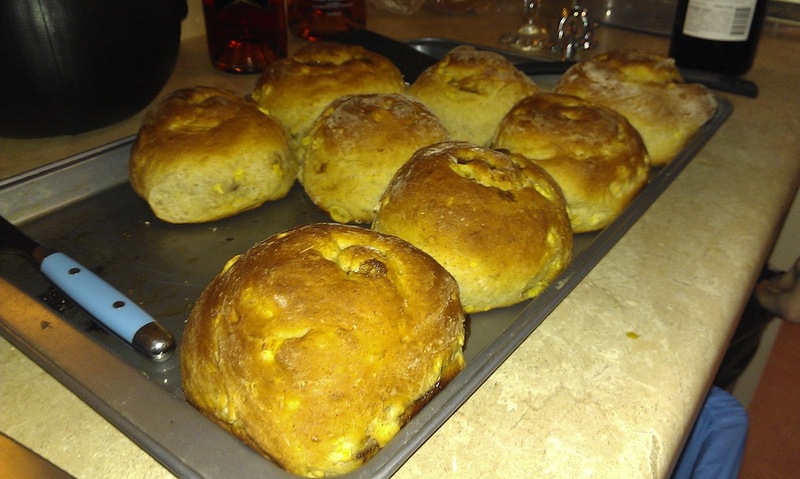 Preheat oven to 375, bake rolls for 20-25 mins. Let cool before frosting, if frosting is desired. They’re probably very good warm! But don’t burn yourself on the hot sugar.